Well haven’t my staff been having some fun….Robby’s been Gulping at Bynoe on the Jacks and Longy’s been rippin’ the billabong barras with plenty of success. Despite the big moon, working weedless shads through the sticks at Hardys proved good enough for a dozen barra in the 60’s during the morning session. Small ‘walk the dog’ style lures also tempted fish over the weed beds and those Threadie Busters did their thing up close to the Pandanus clumps. Bigger fish were hooked, but not landed. Robby had the Gulp 3” Banana Prawn Shrimps working around the Bynoe Rockbars for Jacks, Cod and Barra during the spring tides. These scented Prawns keep proving too good time and time again and there doesn’t seem to be a fish in the sea that doesn’t like ‘em. 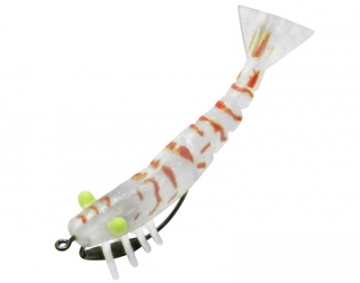 While Im on about the prawn style lures, you may have heard of Zerek….Wow….aren’t they going off. When the going gets tough, the tough get going and that’s exactly what’s been happnin’ here. Both inland and saltwater fish can’t resist these things and being weedless, you can play some pretty insane games with them and still get them back….more often than not, with a fish wrapped around em! Landbased fishing around town tested some gear this week. 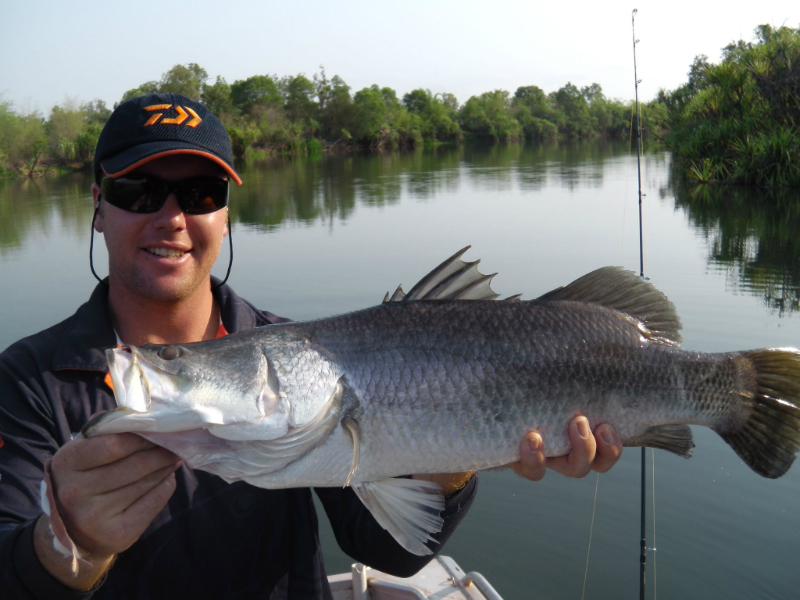 East Point the location and barramundi to 82cm caught on the dropping tide from the rock ledges toward the Ludmilla Creek mouth. Reidys Big B52’s in Gold Bleeding Mullet was the go-to lure on the day so there was no need to go the lighter finesse route. Lee Point is still producing 8kg Mackies toward the top of the tide, particularly on the springs. One crew caught a number of fish within the two hour session drifting pilly baits mid depth in the current. Coming off the big springs towards the neaps this week. The weekend is shaping up to be a winner…weather permitting. Some say that run-off is the prime time for barra fishing….I can’t help but argue that the build-up is every bit as good and with the fishing reports out and about right now, few could argue. From the standout local haunt Shoal Bay including King Creek and The Rock where there’s been numerous 90cm plus fish landed, east to The Narrows at the Adelaide River Mouth and westward all the way to The Moyle the barra fishing has been extraordinary. Big coastal fish are on the prowl around our rocky headlands, on our shallow flats and in around our harbour arms. Just this morning, a mate and I fished a little section of mangrove lined edges within Woods Inlet and managed 9 barra for the morning on Reidys Junior B52’s and ‘walk the dog’ style surface lures. This is quite common for the build-up, particularly when there is little or no wind and a bit of water clarity happening. Get into it before the heavy rains spoil it!! Inland, it’s a bit of a guessing game depending on local rain. I’ve heard both ends of the spectrum from Hardys Billabong….real good and not so good, but it’s still worth a crack by all means. Interestingly, in general it’s been the bigger lures (120mm) that have been cracking the decent fish lately. On the reef scene, rubbly bottom close to Lee Point beach produced some ripper Snapper and Cod for a family crew early this week. Prawn baits worked best at top of the tide. Similar reports came from the upper reaches of Middle Arm with a few juvenile Jew to boot. This weekend will see a bit of tidal run coming off the neap phase, so no doubt clarity will still hold up reasonably well. This will be good for almost all the coastal barra haunts and major rivers alike so I would expect good fishing. You might also notice it’s only a few days away from the full moon which normally spells GAME ON for chasing a barra inland at night. The moon will be up early too, so it shouldn’t mean an all-nighter…. Conditions during last weekend’s 2012 Bluewater Classic tested the patience of many anglers as gusty squalls kept the waters far from glassy. The smaller vessels were forced to fish a little closer but that might have been a blessing for some, with a couple of monster Queenfish caught within the harbour on smaller soft plastics. The bigger boats went wide….so wide in fact, rumour is that a real good Black Marlin was raised at Flat Top Banks. Mal Strong from Craig’s Fishing Warehouse went eastward and fished The Vernons where the Mackeral, Tuna, Goldies and Cod were on the chew. Other boats headed westward, and that seems to have been where the Jewfish responded best…particularly around The Peron region. Plenty of mixed reef species were amongst the catches and although the final tally is yet to come at presentation, all reports suggest it was a very productive weekend for the Bluewater Classic crew. Shoal bay, Shoal bay, Shoal bay…..shallow water and big water temps are recipe for some mad barra fishing and that’s exactly why Shoal Bay is so good right now. 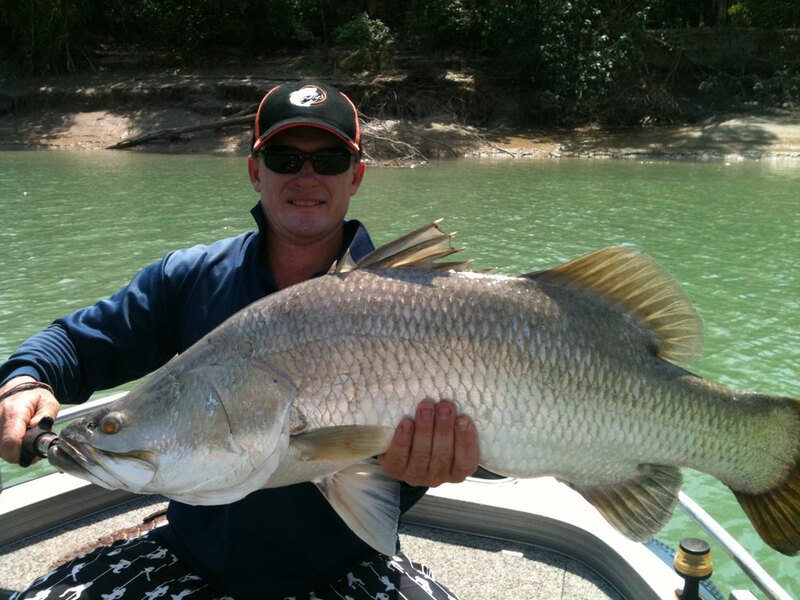 The Rock, King Creek and Tree Point have been winning plenty of metreys on Barrabaits, Classics and big B52’s. I’ve listened to reports of ’10 over a metre’ from the one crew! Back at Buffalo Creek, even the landbased guys have been finding big fish down around the mouth. 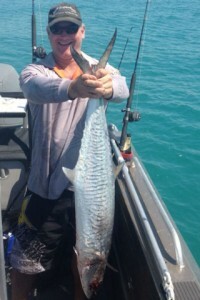 Barra fishing Darwin Harbour is also productive with West Arm perhaps the most credible for now. The smaller Zerek Prawns again did the job on the snake drains and flats, that dead slow retrieve proving all too much for fish to 69cm. The larger sized Zerek has also snared some hefty Trevally from Larrakeyah Rock Wall. Coming off the new moon shortly and into the lights at night….maybe a Billabong trip or even Manton Dam might be on the cards again soon?? How welcome was the rain on Sunday…..the hot breeze that’s been testing our patience lately was extinguished by a downpour that shocked many of us. It caught a few fisho’s by surprise…some were camping at Four Mile in just Mozzie Domes when the storm hit so rather than try and continue sleeping, they went fishing! The fishing has been real good there too with the two crews claiming a total of around 70 fish caught just by trolling down the middle. The Canopy Man’s Nick Billias and I hit The Daly on the building tides and had fun with ThreadieBusters amongst the sticks and big 17A Bombers down the guts. The cleanest tidal waters fell between the Esses and Lizzy, so that’s where we stayed. There’s still some big fish about, with two over the metre hooked but not landed (you will need to ask Nick about that one). Hardies is the pick of the local Billabongs if you’re chasing some size, this year producing plenty of barra in the high 80’s and early 90’s. The Mackie brigade is slowly but surely thinning out close to town, still the odd decent one about but generally sizes are now shy of 10kg. Some big toothy critters have caused havoc at Fenton Patches with the chances of landing a decent fish to the boat being severely reduced of late. As is often the case, The Vernon region is experiencing similar…. sharks, sharks and more sharks grabbing the easy feed. 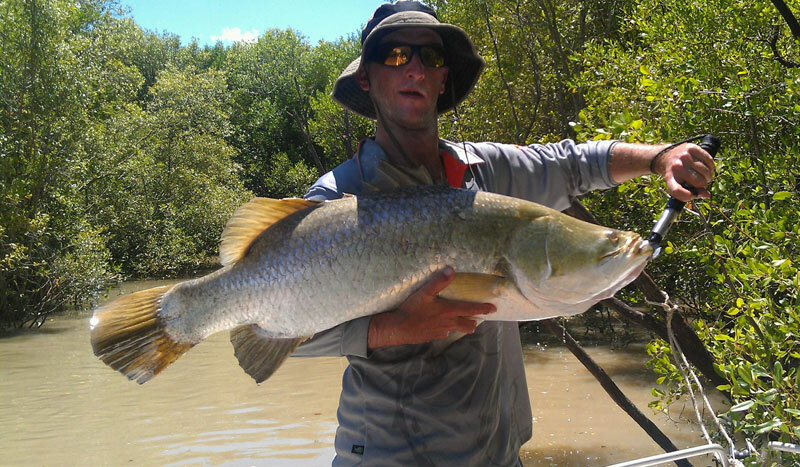 Notable Jewfish reports have come from The Narrows at the Adelaide River mouth. Funnily enough, out of the four boats on site at the time, only two were catching them….location, location. The fish were big enough to destroy the good old Ugly Stick (no high-stick of course!) and bust off plenty of braided line. Just sneaking toward the neaps this weekend….still a bit of run for some fun. Maybe Shoal Bay….what ya reckon? Well the new Zerek Live Shrimps have gone mad this week! These things have been nailing everything from Barra to Salmon, Cod to Goldies, Trevally to Quennies and more. Coming off the neaps was ideal for clarity and a bit of run all in one and these new lures were right on the money amongst the snags in Shoal Bay and twitching off the flats in Middle Arm. Biggest barra report this week went 88cm, from the far end of East Point….now that’s not to be sneezed at! Those landbased fisho’s shouldn’t be complaining either…..it’s been pretty good from the top side of Shoal Bay all the way around to Dundee thanks to the humidity and subsequent water temps. By all reports, Hardies Lagoon held the biggest fish during the SWB Challenge last weekend and it was the F18 Classics that were on the menu. Corroboree is also producing decent fish, but perhaps taking a little more effort to fool. On the bluewater, Mackeral are still about but seem to be shrinking in size?? One crew went wide to Bateman Shoal but said it was tough going, with only a few Trickies about. This weekend is just coming off the springs onto the neaps with Sunday the first of the small tidal runs for this cycle. Some say no run= no fun, so Saturday could be a happy medium for a reef fishing session. Close by, Rick Mills Reef would be a good choice…both drifting pilchards for Macks on the surface and bottom bouncing for Jew at change of tide providing for all possibilities. …play it safe and leave a spin combo loaded with a chromie in case of a sudden Tuna session. Of course, the inland billabongs are a good day out without any concern for tides so I guess there aint any excuses! Here comes the heat and with that comes the barra. It’s starting to hit the straps now with all water temps blazing in the red and the fish are responding well. The harbour flats are bonza with fish to the 75cm mark taking those little Pearl coloured Storm Swim Shads, shallow Bombers and Junior B52’s both on the spring lows and dead neaps. The neaps require the usual quiet approaches up along the mangrove line and sight casting them has been part of the game with such clear conditions. This weekend will see the annual SWB Corroboree Challenge take place at both Corroboree and Hardys Billabongs on the Mary River system. I’d predict plenty of boats at both locations with a strike of pink clothing to boot! Reports of late have been encouraging but as we see during most comps, excessive boat activity might slow them down a little bit. ThreadieBusters were bonza down the Daly last week……even on the bigger tides, we found a heap of fish around the Golden Mile and casting snags with these magic plastics worked a treat on the incoming. Below the S bends was too dirty…no surprise coming off the springs. If you’re after a Jewfish, your odds are pretty damn good. The Shipping Containers off Stokes Hill Wharf held big Jew that loaded up and broke the odd rod this week. Some nice fish to 13kg were landed however….but as always with the wrecks you cant muck about with too much sportsmanship or you will lose. Mal the Master hit The Vernons again and stumbled across some serious Whale watching! Just off the north west Vernon were a pod of whales breaching the water, some of which was caught on his IPhone. Aside from this, Mal caught GT’s, Quennies, LongTails and Goldies for the day. Someone has turned the Crab switch off for now…..almost seem to have vanished overnight. Can’t complain too much though…I reckon this year was the best year ever?? 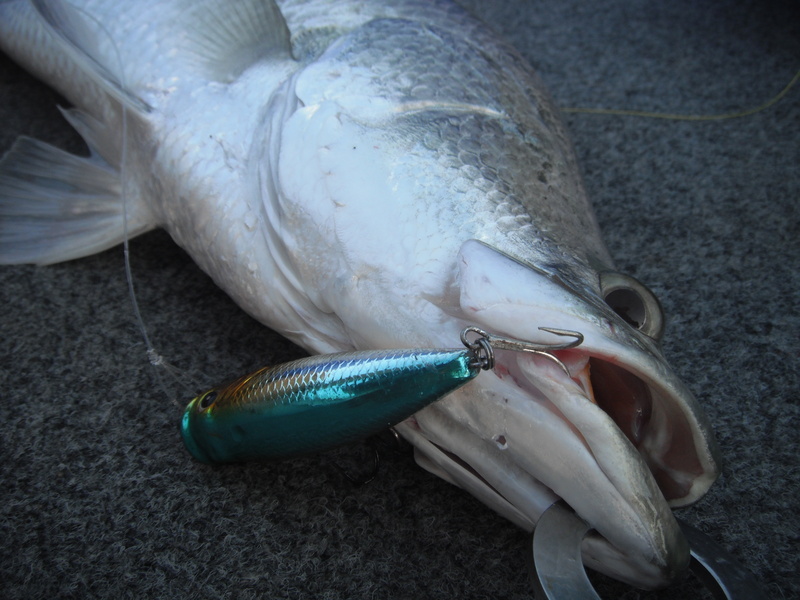 Bring on the Barra….the big coastal fish have no excuses now. Don’t miss the boat folks…..
With all this humidity stuff going on you’d think the billabongs would be going off by now, but I’m yet to hear of anything suggesting the flood gates have opened. I’d say the full moon has had a lot to do with that because water temps are definitely up so there’s no excuses other than fish feeding more at night than during the day. Give it a week or so and approach to the new moon should see all guns blazing on the inland scene. Bluewater however is another story. CFW Staffer Mal Strong shot around to The Vernons this week for some jigging and bottom action as the neaps began to lean out. Mal said the hardest part was getting fish aboard the boat in one piece as the sharks were there in force. Drifting the deep channels found good sized Trickies, Goldies and the odd Spaniard down deep, whereas Smith Reef housed the Pelagic entourage including heaps of Tuna busting up around the boat. Good reports of Jewfish taking squid baits at night came from Charles Point and Lorna Shoal. Most fish are around the usual 12-13kg mark. The local standout is still Lee Point for a quick Mackeral assault. This year the tourists have been getting hammered by monster fish, destroying gear, loosing line, leader and even whole combos over the side. They are telling me that some of these macks are the biggest they’ve seen in ten years of annual visits to the territory. Stokes Hill Wharf proved to be a good land based option last week. Again many fish were lost to the pylons but Queenfish and Trevally were landed following epic battles against the odds. With water temps all good and coming off the neap, Id say The Daly might be worth a trip late this week. In fact, I might see you there….